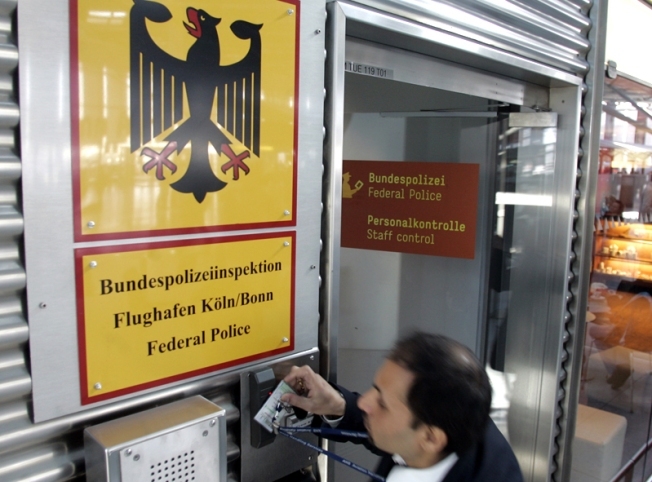 A man enters the entrance to the office of the German Federal police at the Cologne Bonn Airport in Cologne, western Germany on Friday. German police commandos grabbed two terrorist suspects from an Amsterdam-bound flight early Friday before the plane took off from Cologne, police said. German police commandos grabbed two terrorist suspects, A 23-year-old Somali man and a 24-year-old German born in Somalia, from an Amsterdam-bound flight early Friday before the plane took off from Cologne, police said. A KLM spokeswoman said on NOS news in the Netherlands that police boarded the plane when it was at its "point of departure" and grabbed the two suspects. Everyone was then forced to leave the plane, and there was a "baggage parade" to see whose bags belonged to whom, she said. Germany's top-selling Bild newspaper, citing police sources, said the two had been under observation for months and a suicide note was found in their apartment saying that they wanted to die for the "jihad" or "holy war." "In the past we always feared that Breininger would participate in attacks against German soldiers in Afghanistan, but we have very clear information that they are on their way back to Germany," said a security official, speaking on condition of anonymity. "Mr. Breininger is dangerous precisely because he is blond and blue-eyed," said August Hanning, the state secretary at the German Interior Ministry, reported the New York Times. "It would be easier for him to reach certain facilities and areas than someone from Afghanistan or Pakistan."